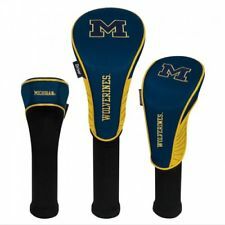 Brand new 3 Pack of golf head covers. These are high quality, durable nylon covers with embroidered logos. Headcover Matching System (r) consists of Driver, Fairway, and Hybrid headcovers. Specifically tailored to fit your clubs, with corresponding woven tag that clearly identifies your driver, fairway, and hybrid club. Driver is designed to fit most 460cc clubs. Constructed of durable 420D nylon in vibrant team colors. Features expandable sock that provides maximum shaft protection.